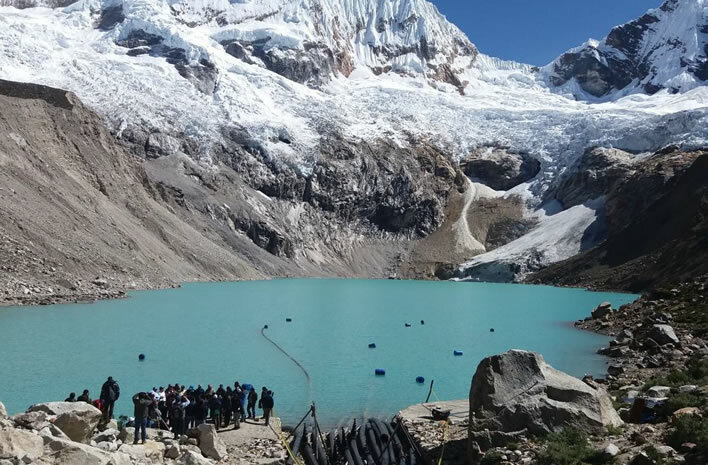 A Peruvian farmer and mountain guide called Saúl Luciano Lliuya, who has a house and farm close to the end of a Peruvian glacier near the Andean city of Huaraz, is suing the German energy giant RWE for the cost of protective measures to his house. The melting of the glacier is causing the level of the terminal lake Palcacocha to rise, threatening him and the villages around. Lake Palcacocha and its melting glacier. The large number of pipes are being used to drain the lake. Image: ©Noah Walker Crawford / Germanwatch. The melting tongue of the glacier. Image: ©Noah Walker Crawford / Germanwatch. According to Mr Lliuya, the cause of that melting is climate change, for which, with its 0.47% of global greenhouse gas emissions, RWE is responsible. He wants 6,400 EUR to secure his house and the villages around want 17,000 EUR from RWE. The modesty of the claims is touching. For a huge company such as RWE these amounts would be barely worth mentioning, of course, were it not for the huge implications there would be for the company if it lost – and for all the other emitters in Germany and then the world. A decision against RWE would establish a precedent with extraordinary consequences. The lower court in which his law suit had been entered rejected his complaint as unsupported and inadmissable. The flooding danger in Peru could not be ascribed to RWE alone. RWE asserted that a single emitter could not be held responsible for global climate change and the possible individual consequences. Anyone familiar with the German legal system will not be deceived by this unusual outbreak of rationality in its courts. The tradition in Germany is for cases to bubble up through the many levels of local and federal courts, with each level reversing the decision of the lower level. Lawyers have to eat, after all. The final outcome depends on who has the deepest pockets and the most patience. A case such as this, with so many legal principles at issue, will ultimately have to go to the top of the legal ladder. Our Peruvian plaintiff has very deep pockets, because his sponsor in this process is the German ecofanatic association, Germanwatch. The question of whether Mr Lliuya is using Germanwatch or Germanwatch is using Mr Lliuya is a matter for our readers to decide. 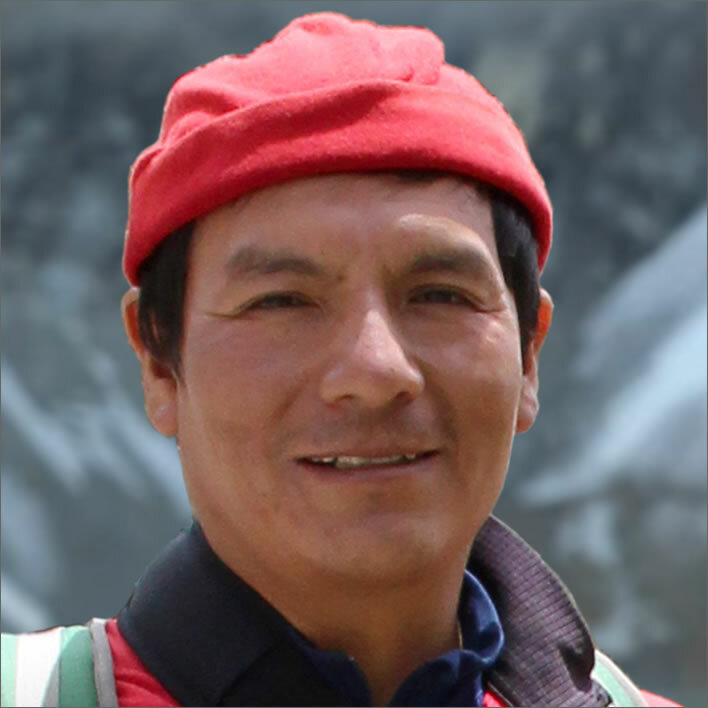 Climate change victim: Saúl Luciano Lliuya, Andean mountain guide. Image: Germanwatch. So, as usual in the German legal system, the decision of the initial court is largely irrelevant. Mr Lliuya/Germanwatch appealed to the next level, the Oberlandesgericht Hamm in the state of Nordrhein-Westfalen, and the court, on cue, reversed the earlier decision and went into the evidence gathering procedure. That step in itself sets a precedent for lower courts. 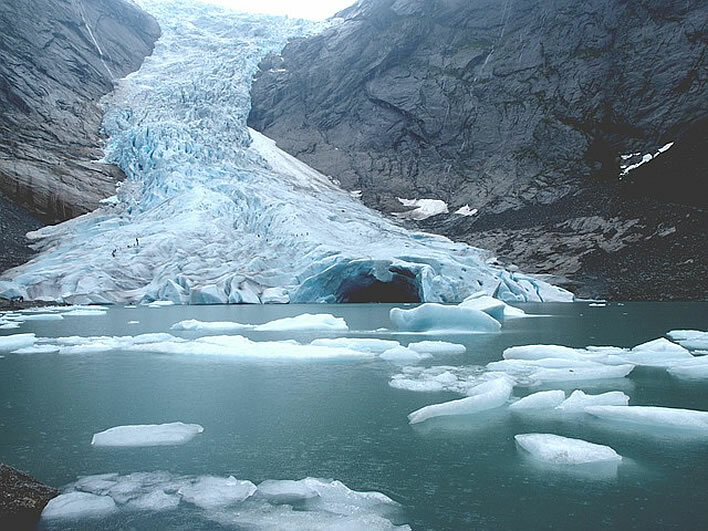 It has taken almost exactly two years since the case was filed in the initial court, so by the end of the whole procedure Mr Lliuya's neighbourhood glacier may have either massively retreated, drowning his village, or massively extended, burying them all under 100m of ice. There will certainly be a lot of long-haul flights between Germany and Peru coming up. The Verursacherprinzip, that is, the principle that the person who causes damage should be the one to pay for it, has been embedded in German law – and many other legal systems – for a very long time. It gained a new lease of life in the seventies in the Ralph Nader consumer protection movement, but has reached its apotheosis with the development of environmental law, now being known as the 'polluter pays principle'. There is an iron logic to this principle, but, like all iron logic, its unbending application can lead down the rabbit-hole into very strange, looking-glass worlds when taken to its logical conclusion. This is the principle to which the next level court returned. If RWE causes damage, it has to pay. Now prove it. The fact is that by proceeding to evidence collection, the court in Hamm has accepted the possibility that a single emitter could be held responsible for a collective act. This should not surprise us, since a court would feel able to proceed against a single member of a gang of robbers even if all the others had not been captured. Hence, in this looking-glass world, Mr Lliuya's complaint cannot be dismissed out of hand. If he and Germanwatch can establish a credible connection between the threat to his livelihood from the rising waters of the lake and the emissions of the energy giant RWE, particularly arising from Germany's long term reliance on burning lignite (Braunkohle) he and Germanwatch have a good chance of success. The German legal system flourishes in this looking-glass world, so the sane who live above ground should not be surprised at whatever result comes to the surface. During the procedure for the collection of evidence that is now starting on its weary way, there will be plenty of German professors and heavyweight science and engineering types with stellar qualifications who will turn out to tell the court about the damage RWE's emissions are doing to life on Earth. More than plenty. The usual suspects – the IPCC, NASA/NOAA,	meteorological societies around the world, the disappearing glacier specialists, the UK Royal Society and all the other panic makers – will beat a path to the door of the courtroom in Hamm. It is not for the court to make a scientific judgement but if it is faced with an apparently impartial scientific consensus that establishes a causal link between RWE and the level of Mr Lliuya's lake then who knows what interesting situations might arise. Even the German government accepts all of this climate change nonsense, so a consensus will be found. We shall enjoy watching the lawer's heads melt when confronted with our lack of scientific understanding of the immense complexity of climate and weather patterns. Peru is anyway a very special case, since its climate is affected greatly by ENSO, the El Niño–Southern Oscillation, that brings relatively erratic swings of temperature and precipitation over multi-year periods. If you were asked to pick the country on earth with the most complex climate, then Peru would be a pretty good pick. No lawyer is going to call into question 'neutral', 'scientific' evidence as opposed to the biased-by-definition nonsense that will come from Big Coal. Whatever happens in this court, the issue will flip-flop slowly through the upper levels of the system for years yet. Finally there will be some settlement. Even if the final decision goes against Mr Lliuya's particular case, it may still leave the gate open for lots of others who have been 'damaged by climate change' to try their luck. What does Germanwatch hope to achieve by dragging their tame Andean mountain guide from Peruvian obscurity through the German court system? To that question there is no clear answer, but some things we can say with some confidence. Germanwatch may say that they want to shut down lignite energy production in Germany, but if they were to do that the German energy system would collapse overnight – the Swiss grid, too, since its green fantasies are fuelled by German 'dirt electricity' through an interconnector. Germanwatch want money, possibly a little bit for Mr Lliuya and his lake, but a little bit for every potential victim of 'climate change' around the world – ultimately a huge amount for them. They will be the winners. We might imagine a scheme that goes beyond carbon certificates, which are currently meaninglessly cheap and completely ineffective. These certificates are supposed to compensate for emissions. The new scheme would be intended to compensate for damage resulting from the consequences of anthropogenic climate change. RWE and all the other 'polluters' in Germany would have to pay into a 'restitution fund', administered by Germanwatch and its fellow eco-crusaders. A small correction is needed here: the energy consumer and taxpayer will ultimately pay for all this restitution. The contributions to this fund will not be left to the market but set by fiat. The amount will be designed to bleed without killing: the successful parasite does not kill its host, the basic principle of such shakedown actions. The billions currently sloshing around organizations such as Greenpeace and the World Wildlife Fund would be swollen even more by the billions in a restitution fund. All the people around the world who are threatened by or suffering from the effects of climate change– sinking under the sea, baking in heatwaves, dying of thirst – will have to be compensated for their sufferings by the German energy user. The reader should now take our simple naivety test. What will happen to this money? a) The billions in the restitution fund will be paid out to help deserving small sufferers such as Mr Lliuya, or b) the money will go through the UN, the NGOs and then the recipient governments in question for… something or other. Mr Lliuya may get a bit at the end. This will be a very big rabbit hole indeed.